I have to say, it's a pretty great time to be a Scary Stories to Tell in the Dark fan. 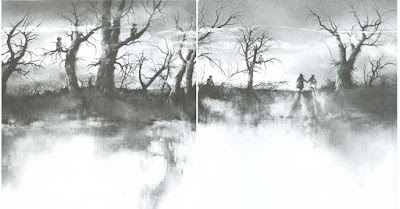 After an ill-advised decision by the publisher years ago to replace the books' iconically eerie Stephen Gammell illustrations with tamer, less disturbing artwork by Brett Helquist, the original versions have been reissued to bookstores everywhere. Hollywood wants a piece of that sweet Scary Stories pie (don't ask what's in it), and there's a major motion picture produced by Guillermo Del Toro on the way which, judging by the teasers, looks amazing. There's even a documentary coming out chronicling the creation of the series and examining its lasting cultural impact. 38 years after Alvin Schwartz's first volume began shocking the senses of countless readers, the series' legacy is still going strong.